Septoria leaf spot, caused by the fungus Septoria lycopersici, is sometimes mistaken for early blight in tomatoes – and vice versa. In fact, tomato plants can be infected with both at the same time. What does Septoria leaf spot look like? Fortunately, it’s not hard to distinguish between Septoria and early blight. Plus, they can be treated similarly. Lower leaves show symptoms first. Round, yellow or water-soaked spots appear on the undersides of leaves. They quickly emerge on leaf tops and turn to black or brown with tiny black dots in the center. Heavily infected leaves turn completely yellow, then brown, and fall. Spotting works its way up the plant and can infect stems. Septoria leaf spot does not display characteristic “target” or concentric spots seen in early blight. When does Septoria leaf spot affect plants? How do you control and treat leaf spot? 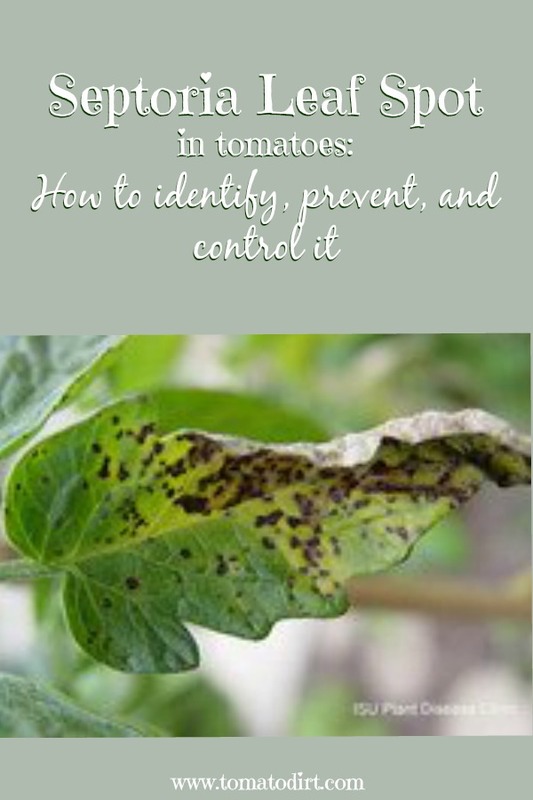 The best control measure for tomato blight is prevention (see below). Remove and destroy infected leaves (be sure to wash your hands afterwards). Once blight is present and progresses, it becomes more resistant to biofungicide and fungicide. Treat it as soon as possible and on a schedule. Organic fungicides. Treat organically with copper spray, which you can purchase online, at the hardware store, or home improvement center. Follow label directions. You can apply until the leaves are dripping, once a week and after each rain. Or you can treat it organically with a biofungicide like Serenade. Follow label instructions. Chemical fungicides. Some gardeners prefer chemical fungicides, the best of which for tomatoes is chlorothalonil (sold as Fungonil, Daconil, or under other brand names. Check labels. You may also choose Mancozeb or Maneb, although these have longer wait times before you can harvest tomatoes safely than does chlorothalonil. Other diseases (such as early blight, late blight, and gray leaf spot) can also be controlled by these biofungicides and fungicides, so application is multi-purpose. How do you prevent Septoria leaf spot? Rotate crops. Although it doesn’t live in the soil, Septoria can survive in garden debris, perennials, and weeds for 3 years. Plant tomatoes in a raised bed to improve drainage and prevent diseases from spreading. Choose strong hybrid varieties to increase chances of plants remaining disease-free during the season.At last check, there are no tomato varieties resistant to Septoria. Give tomato plants extra space (more than 24 inches) to let air to move and keep leaves dry. Water the soil – not the plants – to prevent splashing. Avoid overhead watering. Stake tomato plants for better circulation. Mulch with black plastic or landscape fabric to prevent fungus from spreading up onto leaves. Are bumps on tomato stems harmful to plants?